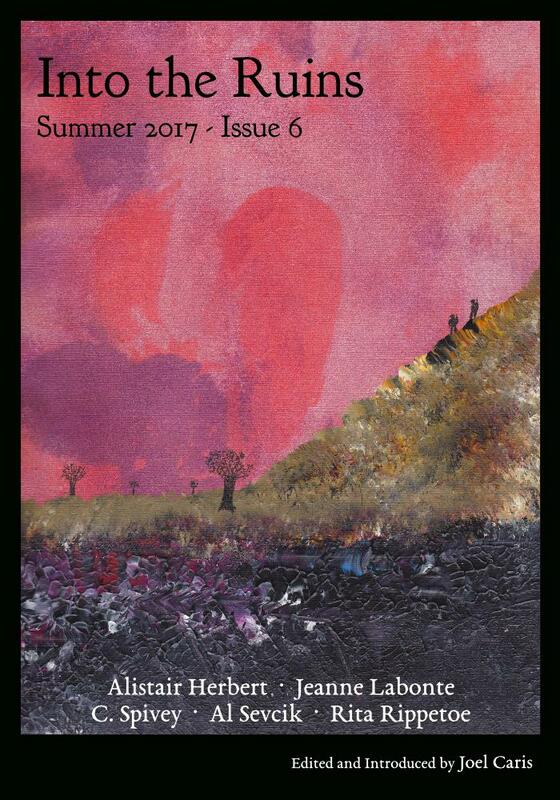 Into the Ruins: Summer 2017 (Issue #6) is Now Available! I’m pleased to announce that the sixth issue of Into the Ruins is shipping to subscribers and is now available for purchase! This Summer 2017 issue features five excellent new stories from authors returning and new, as well as an extended Editor’s Introduction and a host of letters to the editor. A doctor journeys southwest from New York and finds a small community terrorized by religious fanatics. Two children follow a witch into the woods—and discover the dark secrets of the former nation they call home. A young woman chafes against the future lined out for her by others, then sets out in search of a very different kind of life. A man spends years monitoring a small river until one day a hard choice is forced upon him. And sudden, desperate visitors force the leaders of a small town to weigh a threat at the edge of their borders. In this sixth issue of Into the Ruins, journeys and revelations abound. Ordinary people caught up in the complex web of civilizational collapse must make hard decisions, determine who to trust, and open themselves to life-altering discoveries. They travel the land in hopes of finding new lives and helping those in need—and in the process, unveil the hard and complicated futures coming for us, beset with the consequences of our current society’s destruction and excess. Subscribers should be receiving their issues within the next week or two. However, many of you have yet to renew your subscription. Please renew today if you haven’t already! (Or use this direct PayPal link if you’re a U.S. subscriber.) For those renewing, I’ll get the sixth issue (plus any previous ones you hadn’t already received) shipped off to you ASAP upon renewal and your subscription will continue on into the future, ensuring you never miss an issue. If you aren’t sure or can’t remember if you’ve already renewed or if your subscription has expired, feel free to contact me to confirm. Okay, with that out of the way, for those who aren’t ready to subscribe but who would like to check out the sixth issue anyway, you can order a copy here to peruse at your pleasure. In addition to ordering directly at the previous link, you can order from Amazon or CreateSpace, or you can purchase a digital edition of the issue at Payhip. For Canadian readers, the issue should be available soon on Amazon’s Canada site. For other international readers, you can go to the issue page for links to international Amazon sites it’s available at or for a link to order directly from CreateSpace, which ships throughout the world. As always, I encourage readers to send their thoughts and feedback to me at editor@intotheruins.com, both as casual emails (rambling acceptable!) and as official letters to the editor that I can consider for publication in the seventh issue of Into the Ruins, scheduled for November. Comments for contributing authors will be happily forwarded on.